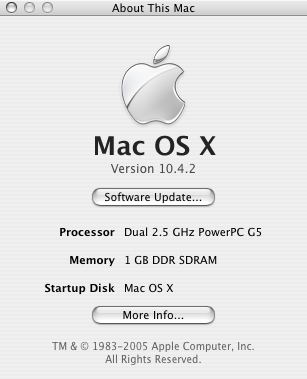 Today, I had completely had it with the swapping and other memory issues in OS X, so I went to the Computerland and bought two very nice and not-so-very-pricy Kingston DDR PC3200 256MB parts and installed them in my Mac. I already can feel some grave differences between 512 MB and 1 GB. For instance, calling the Dashboard is a lot more responsive, the harddisks have more time off, switching between programs isn’t as slow anymore… Of course, there is also the excitement factor, the improvements might not be this great, but there actually are improvements and that’s good. It has to be said, my moments with Linux (albeit short and few) were better than what OS X does to the memory. Much can be improved here on Apple’s behalf, I think.